Industrial valves and safety valves are final process elements and play a key role in the operation of a continuously generating (petro) chemical process or power plant. It is, therefore, obvious that plant efficiency is directly affected by the non-performance of valves, either in terms of output or in terms of reliability and availability. Typical results of incorrectly sized valves, inferior quality and poor maintenance are: safety and environmental concerns; longer start up time; loss of process availability and profitability; frequent maintenance and occasional plant trips; and collateral damage to other expensive plant equipment. 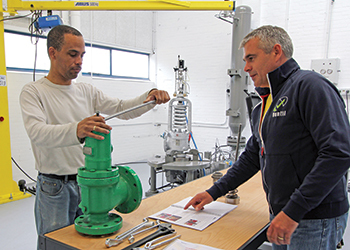 The Ventil Valve Academy, a unit of global company Ventil, is the guide to understanding valves, the process of selection, the do’s and don’ts within the valve ‘repair loop’ of shut-off valves, safety valves and control valves. "The strength of the Ventil training programme lays in the great practical character and, very important and valuable, the ‘brand neutral’ perspective," says Arthur Baars, the company’s global managing director. The Valve academy programme targets the valve professionals, maintenance technicians and valve engineers in the oil and gas industry. The courses are offered in different levels like "User, Maintenance and Engineering" which is driven by the job role and level of experience. Other on-demand and multidiscipline courses are available to enhance the relevance and usability of the technical content. These tailor-made and customised courses can be programmed for a specific audience as per the requirements of the customer. The company conducts instructor-led training at a client’s premises or at any central location in the Gulf region. With branch offices in Europe, US, Middle East, Russia and Kazakhstan, Ventil is the leading manufacturer of high pressure test equipment for industrial safety-, shut-off and control valves. The Ventil programme of delivery includes a wide variety of horizontal and vertical test benches, portable In-Situ test equipment, valve repair tools and transportable workshops, the company says. The company is also a key supplier for custom build solutions. Ventil test units are being used by valve manufacture- and repair companies in over 85 countries worldwide.